Monster Hunter World closed out last year with a record-breaking sales high. Less than a year after its January launch, the hit hunting game reached 11.9 million sales. It’s likely that, by the time of writing right now, it may have breached the 12 million mark. The milestone places it in a secure spot not only at the top of the Monster Hunter’s 14-year history, but Capcom’s catalogue entirely. Resident Evil 5 surprisingly follows with 7.4 million sales. Interestingly, five of the publisher's Top Ten selling games are from the Monster Hunt franchise. Monster Hunter World also secured a spot of national prestige, as it quickly became Japan’s best-selling game on PC to date. Capcom has been punching its best on PC lately. Outside of slashing ‘saurs, the remake of Resident Evil 2 has become that series’ strongest launch on Steam so far. The publisher’s games were the highest-reviewed releases of 2018, according to Metacritic. 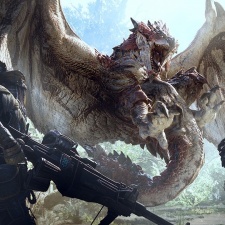 Monster Hunter World's strong performance helped Capcom's net sales for 'digital content', i.e. games, increase by 55 per cent from Y30.8bn ($280.8m) to Y47.9bn ($435.7m).